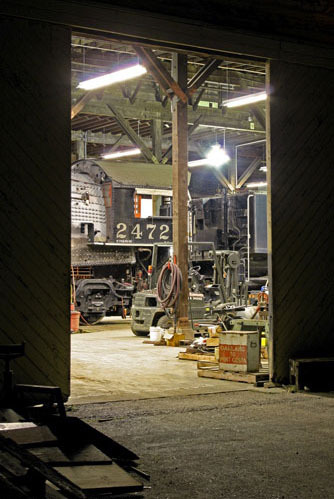 The Golden Gate Railroad Museum began in 1975 as Project 2472, a group of volunteers formed to restore the former Southern Pacific 4-6-2 "Pacific" steam engine #2472. It had been donated to the San Mateo County Fairgrounds and left sitting for more than 29 years. SP 2472 was built by the Baldwin Locomotive Works and delivered to Southern Pacific as a member of the "P-8" class in 1921. It was specifically designed to haul passenger trains on the Overland Route between Sparks, Nevada and Ogden, Utah. On the Pacific Limited and the Overland Limited trains, it averaged more than 10,000 miles a month. As newer power in the form of the MT Class 4-­8­-2 Mountains were purchased, the Pacifics were reassigned to California and used on secondary trains. In the 1940's many of the P­-8 Class of engines moved to the Peninsula Commute service between San Francisco and San Jose. In the 1950's all the P-­8 locomotives were scrapped except for two — the 2467 in Harrison Park, Oakland and the 2472 at the San Mateo Fairgrounds. The 2472 was moved from San Mateo in 1990 to a newly acquired restoration faculty at the Hunters Point Naval Shipyard. The restoration was completed in time for the 2472 to participate in Railfair '91 held at the California State Railroad Museum in Sacramento. It was joined there by many other locomotives from around the U.S. including the SP 4449, UP 8444 and UP 3985. The 2472 operated many mainline excursions in the 1990's including trips to Los Angeles, San Luis Obispo, Watsonville (double­headed with the 4449), Sacramento, Tracy and many trips on the San Jose­San Francisco line. Many interesting railroad cars and diesel locomotives were added to the collection. See the Collection page for details. In 2005, the Hunters Point facility was closed for remediation, and the GGRM collection was moved to the Niles Canyon Railway where operation and restoration efforts continued until 2016. In early 2017 the GGRM anounced that the organization would be moving to a new home in Shellville on the Northwestern Pacific Railroad. Restorantion work shifted to the task of preparing the entire collection for the mainline move to Shellville.